See the classic sights of the Golden Circle, visit some hidden gems, and snorkel in crystal clear glacial water on this exciting day tour. Those looking for a fun and unique way to experience both Icelandic nature and culture should book this tour now. Get your picture taken with a GoPro while swimming across the continents and receive them on your email immediately after your tour at no extra cost! 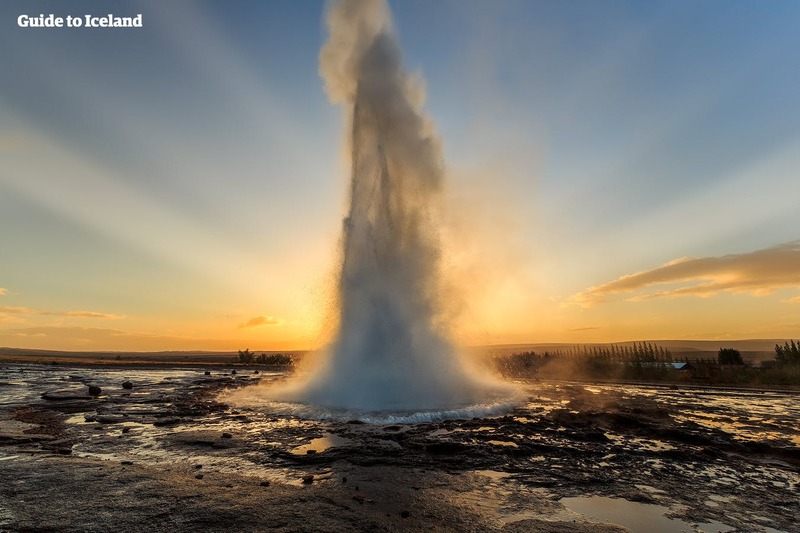 Þingvellir National Park, Geysir geothermal area, and Gullfoss waterfall are the three natural attractions that make up the Golden Circle and no visitor to Iceland should miss visiting these beautiful sights. On this tour, you will not only see the three essential sights. 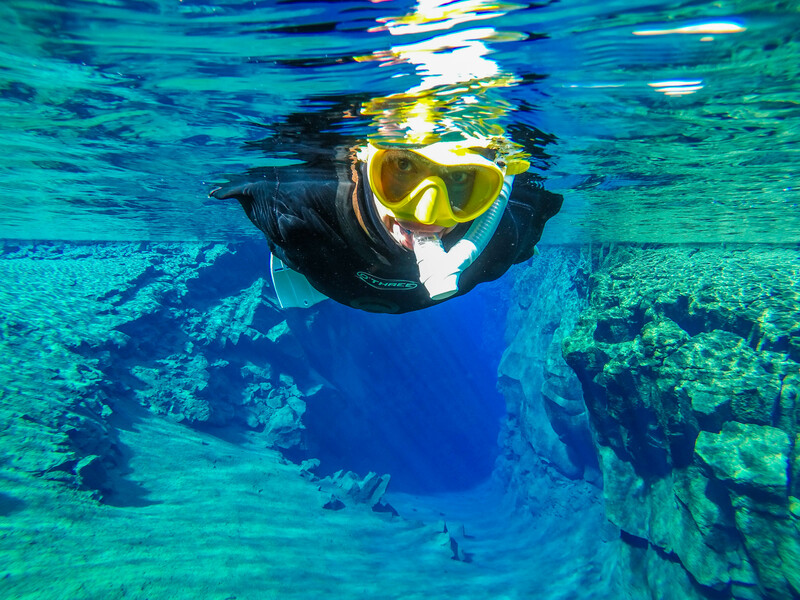 In addition to that, you will get to snorkel in the crystal clear waters of Silfra Fissure, found within Þingvellir National Park. The tour starts when you are picked up in Reykjavík and whisked away to the fissure Silfra. After receiving a drysuit and other snorkelling equipment, you’ll enter the water and will undoubtedly be awestruck by the incredibly bright blue colours of the fissure. 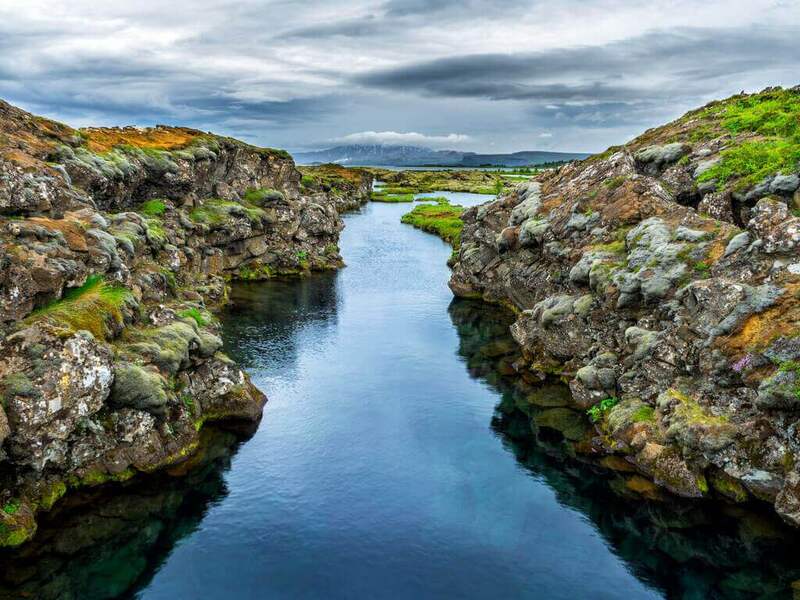 You’ll be snorkelling between continents as Þingvellir National Park is neither located on the Eurasian nor the North American tectonic plates, but in a rift valley between. 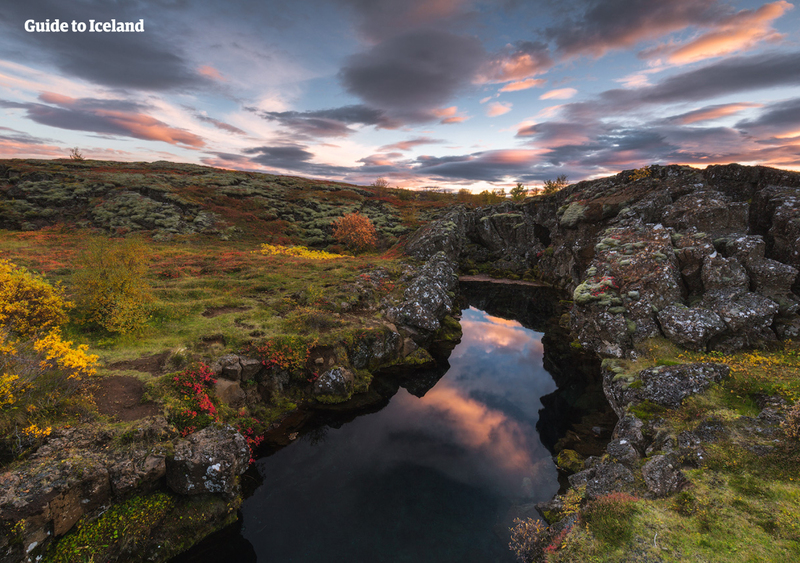 After your journey through Silfra, it is time to explore the rest of Þingvellir, with its beautiful canyons and lava fields. Þingvellir is also the birthplace of Iceland’s parliament as it was here where the Viking settlers would gather to set the laws of the land. From Þingvellir you’ll visit the geothermal area of Geysir where you’ll see bubbling mud pools, steaming and hot springs, as well as the mighty geyser Strokkur which erupts every 5-10 minutes. 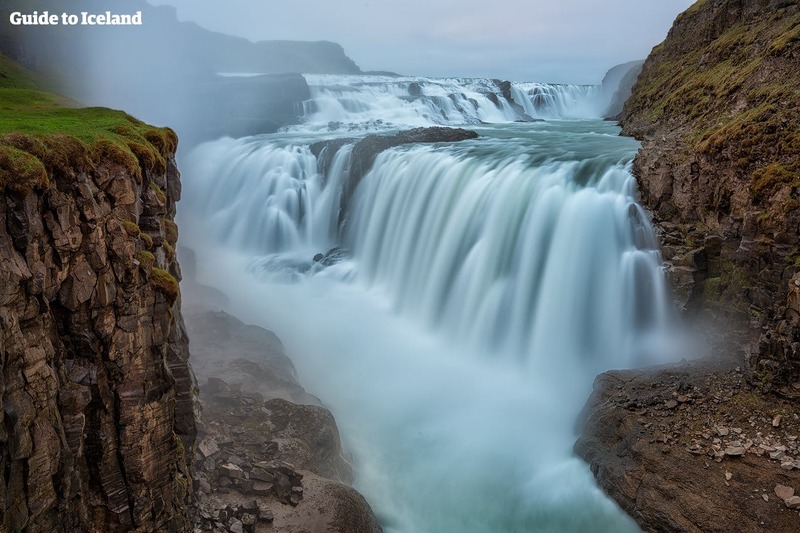 Then, it is off to the stunning waterfall Gullfoss where you’ll watch as glacial water from Langjökull glacier, hurls down in two ‘steps’ into an ancient canyon. Then it is off to some hidden treasures found near the Golden Circle route, an aquamarine lake inside a crater which is made up of red volcanic rocks. Mix sightseeing and adventure with this fun-filled day tour. Travel to some of the best sites in Iceland in a small group and create memories that will last a lifetime and receive free photos at the end of your tour at absolutely no extra cost. Check availability by choosing a date. Have read, signed, and followed directions on the Snorkeling Silfra Medical Statement Form. You can sign the form at the meeting location. You will receive a link to it after you book the tour. This tour was a great way to see the main sights in the Golden Circle. Our Troll Expeditions guide, Christina, was fantastic and her knowledge, fun and energy made the trip extra special. We managed to make a few extra unscheduled stops, including a delicious lunch with Icelandic ice cream at a farm. The highlight of our trip to Iceland was snorkelling in the Silfra. This was an incredible experience and a must do ! This tour was incredible, i can't recommend it enough!! Our tour guide Christina was amazing and was able to answer all the questions i had! Snorkelling between the North American and Eurasian tectonic plates was definitely a once in a lifetime experience so i am incredibly glad i joined this tour! You wear a dry suit so are reasonably warm and whilst your face is in the water i found that it wasn't as cold as i had expected (the hot chocolate and cookies afterwards warms you up as well). Christina took great photos of everyone snorkelling and emailed them (for free!) that night! The Golden Circle was great and we were able to make more stops along the way (getting the best ice-cream in Iceland and stopping to see Icelandic horses)! I 100% recommend this tour - DO IT! 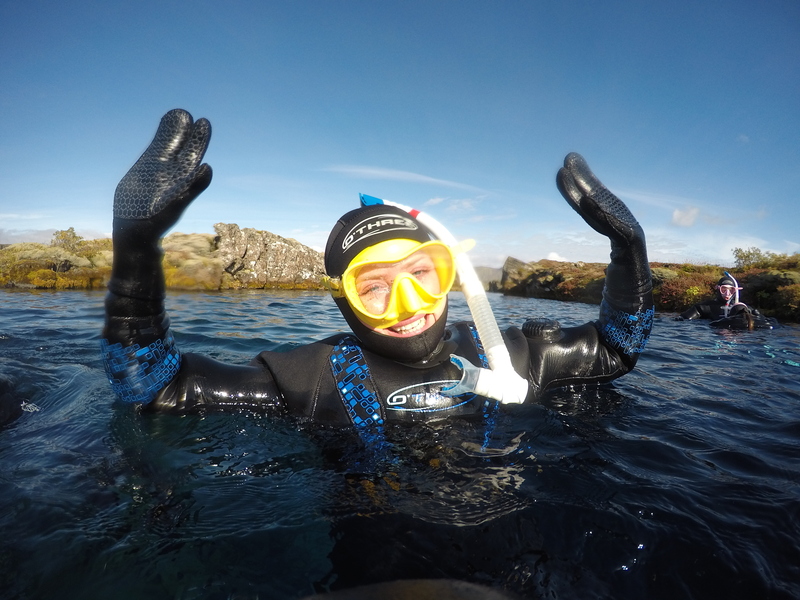 A fantastic day trip, a must do from Reykjavik and definitely include the snorkelling. The day was well planned with enough time at each stop. The stops were varied and interesting. Snorkelling was amazing, with the dry suits we were totally dry and even warm the whole time, with hot chocolate and biscuits afterwards. GoPro pictures taken by the snorkelling guide were then uploaded to GoogleDrive and shared with us all later for free. It was the brightest and most memorable experience from my trip to Iceland! I won't lie, I was super scared to get frozen in Silfra in December, so took with me a huge bag of warm clothes and socks =))) All doubts appeared absolutely unnecessary! Our guides Ronan and Matias took care of everything! They provided us with warm clothes to put on under dry suit, what made the experience completely comfortable and absolutely fascinating! Before snorkeling, Ronan took us on an amazing trip along Golden Circle, told us a lot of stories about Iceland and answered all, even most tricky questions =) After snorkeling, guys cooked for us hot chocolate and cookies what helped to enjoy the post-snorkeling chat and sharing of emotions. I strongly recommend this tour to everyone who wants to add adventures to their trip to Iceland! Fantastic experience from start to finish. Highly recommended. This was an amazing tour and our guide Ronan was really entertaining and informative. It is definitely worth paying a little extra for a small group as we did a tour the day before on a huge coach and it was much less personal and not as engaging. We saw good sites and had ample amount of time at each location. Unfortunately the weather was too bad for us to do the snorkelling which I was looking forward to but we were able to join another tour the next day to make up for it! Don’t miss this tour when in Iceland. Truly, truly worth it! I had taken another tour but cancelled and opted for this one as I was on a short stay and wanted to have the fullest possible day. Well it turned out to be the best idea! My guide, Ronan, was true truly awesome, funny and full of little stories that make the difference on these outings. If your looking for the Golden Circle full experience, this is it! We have been to this tour in November 2018 and we highly recommend it. Our tour guide Ronan has been an excellent leader, assistant and story teller as he knew many interesting, historical and fun facts about Iceland. He has been very professional in explaining and guiding us through the snorkeling preparation and the activity istelf. We are glad we chose the snorkeling tour as this was defientely the best and unforgettable part of the trip. The Silfra looks like a normal pond from the outside but then you have this breathtaking wview when you dive in. The tour proceeds to the wonderful Gulfoss waterfall (maybe this deserves a bit more time to stop and take a walk), the Golden Circle, the Kerid Crater and... icelandic horses petting! Thank you Ronan, Guidetoiceland.is and Troll Expeditions for this wonderful experience and see you again! THIS! WAS! INCREDIBLE! We ended up having a private tour which was absolutely unbeatable! Our guide was fun and knowledgeable (and had great taste in music which we found out later in the day). We got to snorkeling early and had an amazing time with Pierre Henri. He was such a fun time and so knowledgeable. I was travelling with friends who were a little nervous about the snorkeling, but we were put at complete ease. The rift was absolutely incredible and not nearly as cold as I had imagined. A friend of mine had been to Iceland recently and booked snorkeling with another provider and claimed that the rift was cold and that he'd gotten most of his clothes soaked, but even though we went two months later than he did, we didn't spend our time freezing and other than our hair, nothing got wet. I truly think that this is down to how well this provider prepared us. Plus, we didn't have to worry about taking photos because our guide took them for us (and they were incredible). Our guide for the rest of the day was equally amazing. Since there were no others on our tour, he let us spend as much time as we wanted to at certain places and he answered all of our questions about Iceland. I would (and already have) recommended this tour to people travelling to Iceland. Amazing once in a lifetime experience. I hate the cold but the dry suit keeps you warm. I would recommend it to anyone. This tour was amazing! The guide was knowledgable and fun. He shared lots of personal stories and the group size was small which allowed for lots of interaction. Snorkelling in Silfra was an absolute highlight. The water is so clear you feel like you are flying. The geography is unique and breath-taking. I would DEFINITELY recommend this tour to anyone travelling to Iceland. I'm glad I paid a little extra and opted for the Golden Circle plus Snorkeling Silfra. 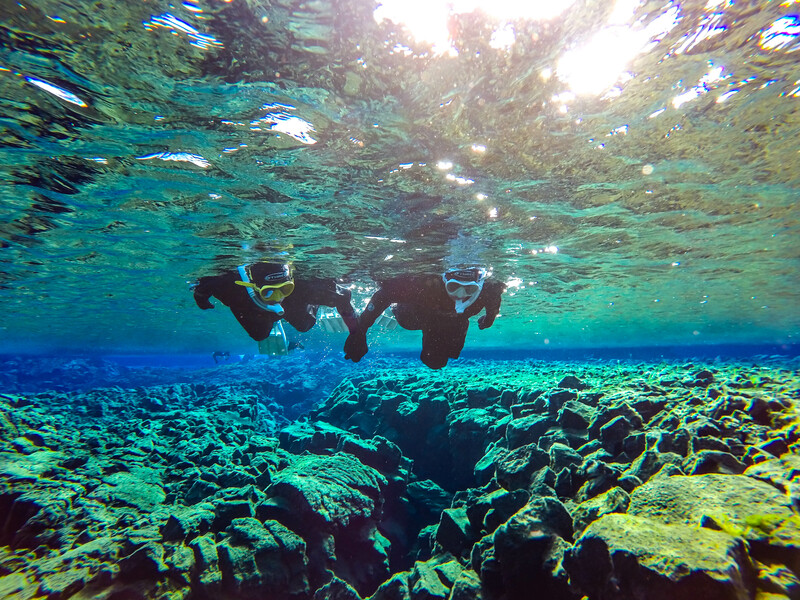 We made many stops throughout the Golden Circle but, snorkeling was my favorite. Christina was our snorkeling guide and she did an amazing job of getting us suited up, sharing safety information, and guiding us through Silfra while also taking some memorable photos. The weather was perfect and without the unde suit and dry suit on, my face was the only thing that was cold for the first 20 seconds. Highly recommend snorkeling. This tour was an amazing experience! Harpa was my tour guide and she was awesome! She had a lot of knowledge about Iceland and the area we were in. She also made great use of our time and gave us plenty of time at each stop. I loved the small group part of our tour (there was only 3 of us) so it felt more like a private tour. The snorkeling was incredible. We had a different guide for that, Pierre Henri, who was great! He made sure we were all comfortable in the gear and in the water. Overall I loved the tour and highly recommend it! Highly recommend this tour! Had the best time and will never forget this day. I really liked this tour. It had everything I was really interested in or the Golden circle and snorkel. The golden circle was really cool and our guide told us many stories about Iceland and the hidden people for example. He was very knowledgeable about all my questions and I liked him a lot. Snorkeling is such a cool experience! Being underwater in the beautiful clear water in Silfra was a life changing experience for me. Our guide was really helpful the whole time and explained every part of the trip very well so everyone in the group felt safe. He went over all the details many times. The water was really cold at first but I got used to it soon. I would honestly like to do this tour again! It was so much fun and thank you Sol for being the best guide ever!